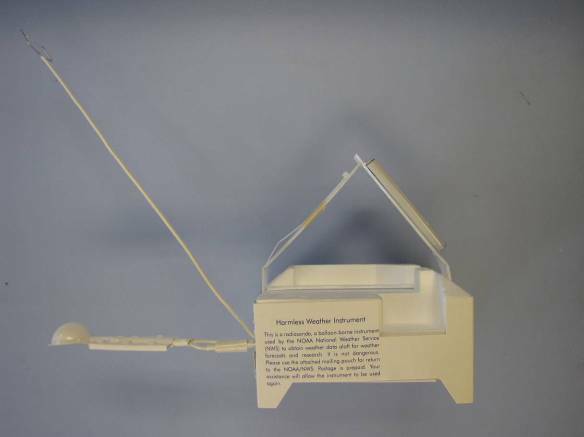 Since the late 1930s, the NOAA National Weather Service (NWS) has taken upper air observations with radiosondes. The radiosonde is a small, expendable instrument package (weighs 250 to 500 grams) that is suspended below a large balloon inflated with hydrogen or helium gas. As the radiosonde rises at about 300 meters/minute (about 1,000 feet/minute), sensors on the radiosonde transmit pressure, temperature, relative humidity and GPS position data each second. These sensors are linked to a battery powered, 300 milliwatt or less radio transmitter that sends the sensor measurements to a sensitive ground tracking antenna on a radio frequency typically ranging from 1676 to 1682 MHz or around 403 MHz. Wind speed and direction aloft are also obtained by tracking the position of the radiosonde in flight using GPS or a radio direction finding antenna. Observations where winds aloft are also obtained from radiosondes are called "rawinsonde" observations. The radio signals received by the tracking antenna are converted to meteorological values and from these data significant levels are selected by a computer, put into a special code form, and then transmitted to data users. High vertical resolution flight data, among other data, are also archived and sent to the NOAA National Climatic Data Center. A typical NWS "weather balloon" sounding can last in excess of two hours. In that time, the radiosonde can ascend to an altitude exceeding 35 km (about 115,000 feet) and drift more than 300 km (about 180 miles) from the release point. The radiosonde is suspended 25 to 35 meters (~80 to 115 feet) below the balloon to minimize contamination of the temperature measurements from heat shedding off the balloon skin. During the flight, the radiosonde is exposed to temperatures as cold as -90ºC (-130ºF) and an air pressure less than 1 percent of what is found on the Earth's surface. If the radiosonde enters a strong jet stream it can travel at speeds exceeding 400 km/hr (250 mph). When released, the balloon is about 1.5 meters (about 5 feet) in diameter and gradually expands in size as it rises owing to the decrease in air pressure. When the balloon reaches a diameter of 6 to 8 meters (20 to 25 feet) in diameter, it bursts. A small, orange colored parachute slows the descent of the radiosonde, minimizing the danger to lives and property. At the present time, data are not collected while the radiosonde descends. Although all the data from the flight are used, data from the surface to the 400 hPa pressure level (about 7 km or 23,000 feet) are considered minimally acceptable for NWS operations. Thus, a flight may be deemed a failure and a second radiosonde is released if the balloon bursts before reaching the 400 hPa pressure level or if more than 6 minutes of pressure and/or temperature data between the surface and 400 hPa are missing. Worldwide, there are over 800 upper-air observation stations and through international agreements data are exchanged between countries. Most upper air stations are located in the Northern Hemisphere and all observations are usually taken at the same time each day (up to an hour before 00:00 and/or 12:00 UTC), 365 days a year. When severe weather is expected additional soundings may be taken at a select number of stations. NWS takes observations at 92 stations; 69 in the conterminous United States, 13 in Alaska, 9 in the Pacific, and 1 in Puerto Rico. NWS also supports the operation of 10 other stations in the Caribbean. I found a radiosonde. What should I do? How are radiosonde data used? Understanding and accurately predicting changes in the atmosphere requires adequate observations of the upper atmosphere. Radiosondes provide a primary source of upper-air data and will remain so into the foreseeable future. What types of radiosondes are used by the NWS? Note: The Mark IIA Radiosonde was phased out of the NWS weather balloon network in early 2015. NWS sounding - A virtual tour on preparing and launching a NWS GPS radiosonde. Network Maps - Maps showing station locations of NWS offices that take radiosonde observations. History - History of upper-air observations.